Food losing its freshness can take a toll on both our appetites and budgets. We’ve compiled a few tricks to maximize your food’s longevity! 1. 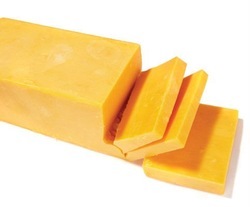 Stop cheese from drying out by spreading butter or margarine on the cut sides to seal in moisture. This works especially well on hard cheeses. 2. To keep cut avocados from turning brown, refrigerate them flesh side down in a bowl of water and a splash of lemon juice. They will stay green for several days. 3. Wrap your celery in foil to keep it crunchy for weeks. If it’s wilted, cut off the root and submerge the celery in a glass of ice cold water, then refrigerate it to restore it to a crisp state. 4. Storing sour cream upside down in the fridge will slow down the oxidization process and keep it from spoiling. 5. Don’t be too quick to throw out your eggs: there’s a simple method to test their freshness. Fill a saucepan with cold water and place the egg in it. If the egg sinks to the bottom, it’s fresh. If the egg sinks to the bottom, but stands on its point, it’s still good but needs to be used soon. If the egg floats to the top, it’s no longer good to eat.